Looking for fun frum family trip ideas? Search through our trip notes to find great ideas for your Chol Hamoed Trips, Kosher Summer Trips, Mid-Winter vacation outings, or just a Family Shabbos Getaway. Our comprehensive Frum attractions listings are helpful for Shidduch dating spots too. Just follow the Hippo for all your kosher trip needs! Lancaster is one of the most popular vacation destination for Frum families with young kids, and for good reason. There are lots of fantastic kid-friendly attractions, and the atmosphere is generally refined and respectful. It’s also cool to watch the Amish riding horse and buggies around the main roads. Our family had such a good time, we replayed the trip again the next year! $39.99 per person; kids 2 and under are free.) Kosher Mart has concessions in the park selling either pizza or hot dogs, burgers in delicious pretzel buns, and chicken nuggets, among lots of other choices. How’s that for a convenient kosher dinner plan?! your ticket and allow you to return the next day for free. Full and content, we pulled up at the Eden Resort and settled into our 2-bedroom suite. We found the resort to be very clean and the hotel staff was really kind and helpful. Tip: Try to request a room far from the Lobby, as it will be quieter. With so many frum guests, a convenient Mincha/Maariv minyan was organized right in the hotel. We like to bring along board games to play, especially when we are stuck in the hotel early for our toddlers’ bedtimes. We like Othello, Pictionary, and card games, among others. After Shachris and our own breakfast in the hotel, we started our day at the Amish Village. TIP: I would highly recommend not taking infants on these buggy rides. My poor baby screamed the whole ride. The bigger boys loved it! There’s a large gazebo with lots of picnic tables and oversized handmade wooden games like chess, checkers, and shuffle board which kept the kids happy while we finished our lunch. We enjoyed some refreshing fountain sodas at a stand at the farm, and learned how to churn our own butter at a live session. The bathrooms were nice and clean and they have a separate nursing station cabin stocked with diapers and wipes! Now that’s what I call Mommy/baby-friendly! We spent around 3 hours on the farm, and the kids were perfectly exhausted and ready to sleep through our 3 hour drive home. Wednesday; there’s a higher probability of a video-only tour on Thursday and Friday. What an awesome trip! Enjoy and keep following the Hippo! And you definitely want to subscribe to our Trippo email list- we share exclusive discounts from kosher attractions as we get them! Happy travels! 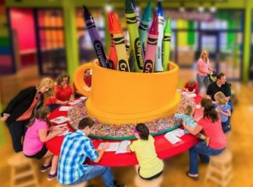 We visited this fun crayon factory as a stop on our way to Lancaster. They have lots of fun activities for kids, including making crayon molds, interactive art, dancing exhibit, a playground, and more. It was a good start to a great trip! This is by far our family’s favorite attraction in Lancaster. It’s is a farm-themed outdoor play park where you can churn your own butter, jump on giant pillows, race down hay chutes, and try to find your way out of a corn maze. It’s not cheap, but it will keep your family busy with wholesome fun all day. 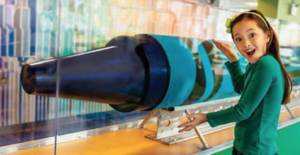 Excellent amusement park geared toward kids age 11 and under. This theme park has more of a commercial feel than Cherry Crest Farms, but it’s nice how the little kids can ride on everything since it’s made for their ages. Dutch Wonderland has a “Preview” offer: You can come the first day less then 3hrs before closing, and they will stamp your ticket and you can return the next day free. 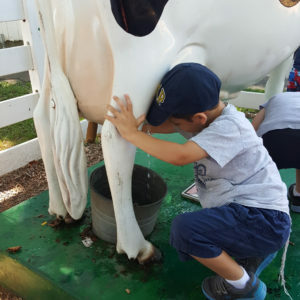 Located on 12 scenic acres, The Amish Village lets visitors tour an authentic Amish property, including a one-room schoolhouse, barn with farm animals, blacksmith shop, smokehouse market. They also have a playground, small petting zoo, and (wild!) buggy rides on premises. The factory is about 45 minutes South of Lancaster. This tour is fun for adults and kids alike, but be sure to reserve in advance. You get to watch the workers making chips in real time. The tour takes about an hour. It’s reasonably priced at $3-$4 per person and kids under 4 are free. The best part? You get fresh hot potato chips free at the end of the tour. There are several hotels that are popular among the frum crowd during the summer, so minyanim are easy and convenient. (You don’t need to stay there to take advantage of the minyanim). Eden Resort offers 2 and 3 bedroom suites that can accommodate 8 people. Both hotels have lots to do on the premises, including indoor and outdoor pools, water playgrounds, and more. They also both have family-friendly rooms and suites. Book early because they fill up quickly in the summer. Quality Inn– right across from Dutch wonderland and is a cheaper hotel than the above. There are generally minyanim there during Bain Hazmanim too. Central PA’s Kosher Martduring peak tourist seasons. Kosher Mart also delivers to hotels, and they also sell discounted park tickets. Checkout their website centralpaskoshermart.comfor details or call (717) 951-3297. If your’e willing to drive a bit out of the Lancaster area, The Giant is a Supermarket on Linglestown Road in Harrisburg. They offer a Kosher selection of cheeses, meat, and chicken. They also have Kosher frozen foods like pizza and Klein’s ice cream. Note: The deli counter says Kosher, but it is not under Hashgacha. The Darrenkamps Supermarket, across the street from the Doubletree, sells Cholov Yisroel milk. Look for the Kreider’s Farm bottles with a hebrew date in the bottom right-hand corner of the bottle. Degel Israel (717 397 0183) has Minyanim for Mincha and Maariv. During peak season, there are usually multiple minyanim in the popular hotels and resorts. DISCLAIMER: Kashrus of any establishment mentioned by Trippo Hippo is not guaranteed and should always be independently verified.